Start by opening Internet Explorer. Eventually, the Windows 8.1 preview will be available directly through the Windows Store, so you may not need these first few steps. 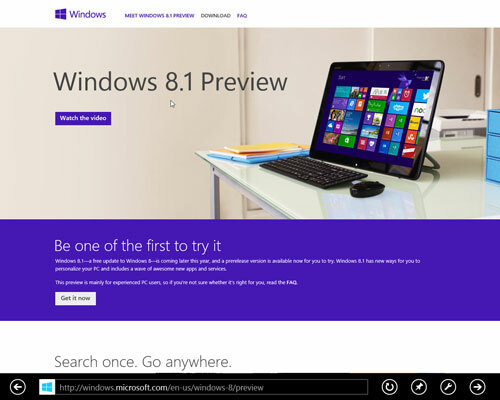 Navigate to the Windows 8.1 Preview page. Enter the URL in the Internet Explorer address bar. Click The Get it now button. If you’d like to find out more about the preview to see if it’s right for you, click the FAQ link at the top of the page. Click the Get the update button. You may want to create a USB recovery drive before continuing by following the directions on the download page. You can also save the download for later running by clicking the Save button. 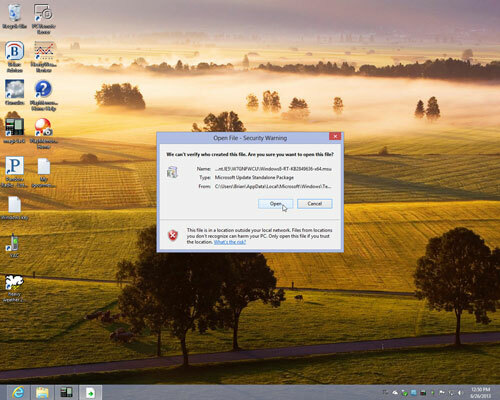 When you see the Open File – Security Warning dialog box, click the Open button to continue. After you click the Open button, the installation will continue. Once the update has been installed, you’ll be prompted to restart your PC. 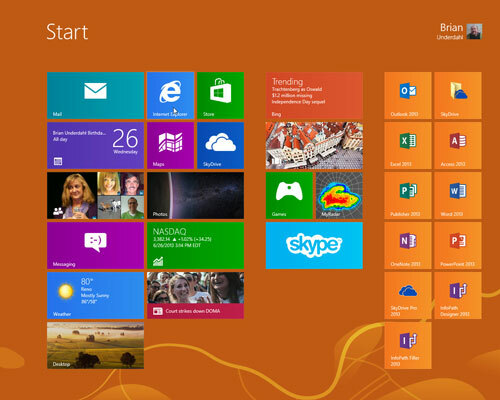 When you’re system has restarted, click the Store icon to open the Windows Store. 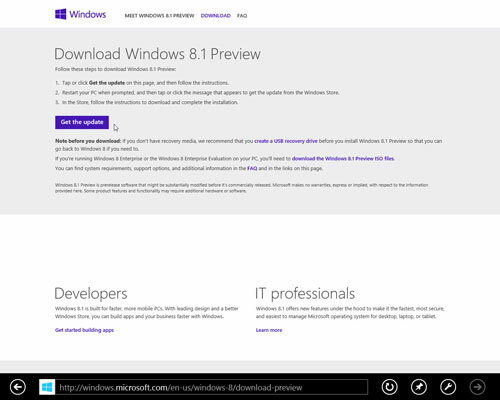 At this point you’ll see a prompt offering the Windows 8.1 Preview and you should click the Upgrade button to install the Preview. If you receive a message that tells you that the update does not apply to your system or if the Windows Store doesn’t offer you the option to install the Windows 8.1 Preview, you can try a more advanced option of downloading the iso files, burning a disc, and installing the Windows 8.1 Preview from that disc.